This year has been rather a whirlwind, as they all seem to be. 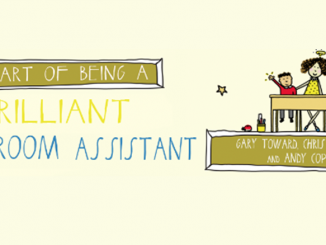 My role as a Senior Teacher, like the title may not imply, covers a very broad set of responsibilities. Within a whirlwind year it is difficult to make sure that all the plates remain on top of the poles and continue to spin, this is one reason why it has taken so long for this post, and the ones that are in draft form yet to be published. However, the extra time taken has allowed me to spend a little more time thinking about what I wanted to share, for it is certainly true that my mindset has shifted a lot since my last blog post was published. This is a re-blog post originally posted by Adam Atkinson and published with kind permission. The original posts can be found here. 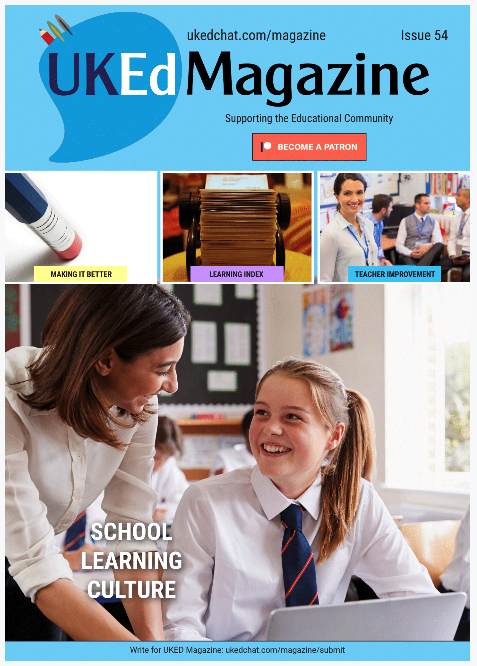 Would you like to get published on UKEdChat or UKEdMagazine? 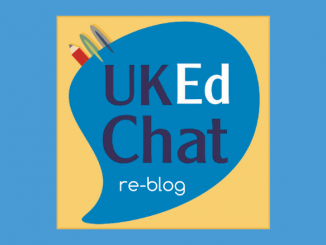 Submit your article (or blog post for reblogging on UKEdChat.com) by clicking here. or via our free SmartPhone app. Click here for more information. In September 2015 we introduced the new curriculum across all subjects and all of our school. This was scaffolding using the Chris Quigley’s Essentials materials, during the previous year we had used a numeracy curriculum created by teachers within the Deal Learning Alliance, which a great source and piece of collaborative work in its own right, held too many links back to APP statement and old national curriculum levels. 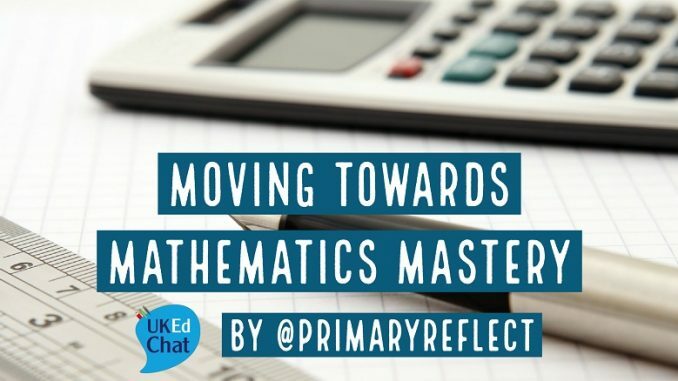 As as school we were finding that the DLA maths document did not provide the scaffold for the raised expectations in mathematics primary curriculum, furthermore, the deeper into the curriculum we delved, the harder it seemed to make the teaching, learning and assessment work efficiently. We are now working using the Essentials curriculum Milestones which are broken down into three stages: Basic, Advancing and Deep and use Otrack and Class track to assess pupil attainment and progress against these Milestones through the learning cycle. This system is being used across all subjects, and the initial impact has been very positive, teachers, subject leaders and senior staff are all able to see where all pupils are currently in their learning journey. This has provided an effective initial insight into monitoring of teaching and learning. Throughout term one and term two we shared several resources and techniques for teachers to begin to apply, not only in their teaching of mathematics, but across the curriculum. 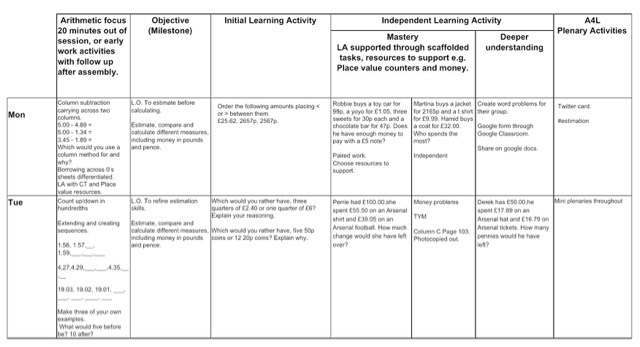 For maths the key resources shared were from the NCETM progress and assessment that materials. 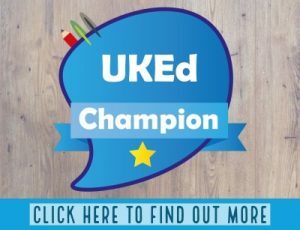 During November and December I continued to research approaches to a mastery model and trailed several different approaches within my class room, for example using the NCETM ‘Teaching for Mastery’ materials as starter activities, and using exit slips and other self reflection resources to challenge the learners in my class. 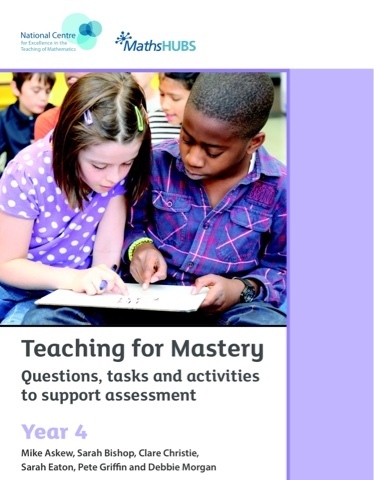 In January we undertook a maths book-look, with the teachers as a development opportunity. Through this book-look teachers were able to show the quality of the learning achieved by the children in their maths. 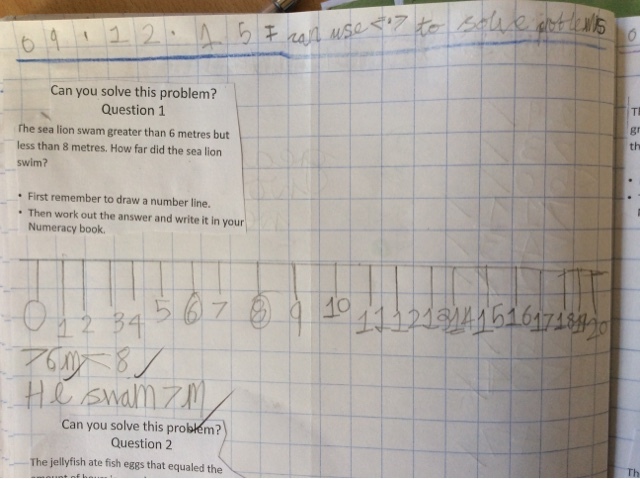 In all classes it was quite clear the procedural calculations and learning of number facts was strong, however, what was also clear was that there was an imbalance between the amount of procedural practice against deeper reasoning and application. There were several examples of children demonstrating effective reflection on their learning, particularly in the upper key stage two classes and some examples in each class where mastery questions and test base style examples were used to get the children to apply their learning. However, these were still not common place. Teachers were directed to provide more time for reasoning and application tasks, using the NCETM materials to guide their thinking. Response to the direction was very positive, teachers could see the changes were needed in order for their class to attain their year group expectations. After discussions around mastery approaches and learning in my class with other members of the SLT at the book look we decided to trial a slightly different approach where the procedural arithmetic skills would be taught in separate sessions from reasoning sessions, with the expectation that all learners can achieve the age expected milestones, I began to further question what differentiation was going to look like in our classroom. After working this way for a week it was clear that the planning format needed tweaking, and still does. However, the discussions had as a year four team and with my children have galvanized my belief that this approach is the right one for my pupils. 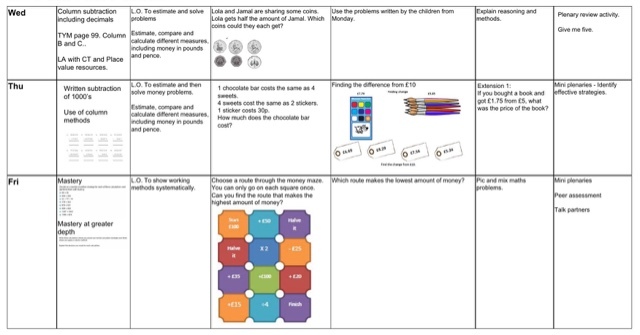 In today’s reasoning session my traditional ‘less able group’ were able to show a clear understanding of how to solve the problem: “Which would you rather have, five 50p coins or 12 20p coins? Explain why.” They were then able to move onto the deeper learning activity and were able to solve and explain their understanding of the problem using resources to scaffold and support their learning. In previous years it is quite easy to imagine that this group of pupils would have remained working at a far lower level than their peers, instead of being able to access the content and challenge of the main activity with the rest of the group. The plans lean heavily on the content from the White Rose and NCETM materials but a clear direction of learning journey was certainly clear after our team planning session. Our working wall has also evolved compared to the progression through skills model used last year. 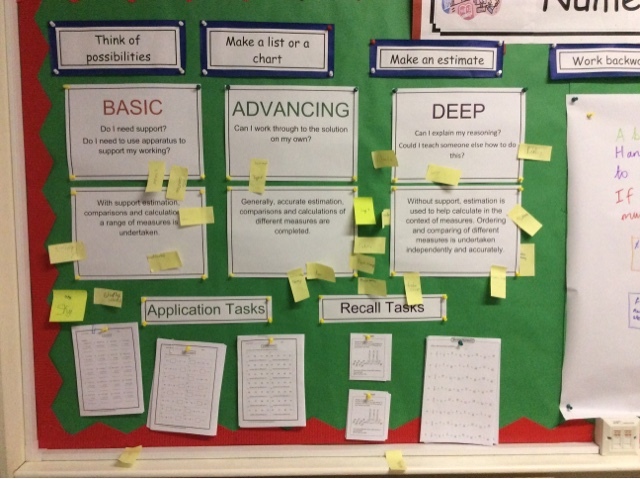 This week I have trialed placing ‘Application Tasks’ on the working wall which give the children exposure to the arithmetic or reasoning tasks in different contexts, and ‘Recall Tasks’ that challenge the children to revisit the previous topic or area of study. The children have been allowed to choose one of these tasks when they feel they have ‘mastered’ the objective of the session. The initial reaction to this from the children has been very positive. As has their taking to our ‘Pick and Mix problems’ pouches – thank you to Mrs Curling from The Downs for showing me this simple but effective idea. Quite simply an envelope stuck in the back of the children’s book, into which word problems and test base examples can be kept for the children to access at any time. Any leftover sections of sheet work and prompts can also go into the envelope ready to be used to show that the children have retained their understanding away from the point of learning. I am not claiming to be doing anything radical or truly innovative, and I don’t feel that we, as a school, are far away from ‘cracking’ the new maths curriculum, but I wanted to share some of the ideas and resources that I have harvested this year. I certainly feel that my practice has changed for the better since the start of the year, and as we further grasp the mastery approach, I can see my pupils becoming more confident applying and using their skills. Session 292: Is assessment in schools really in a mess? 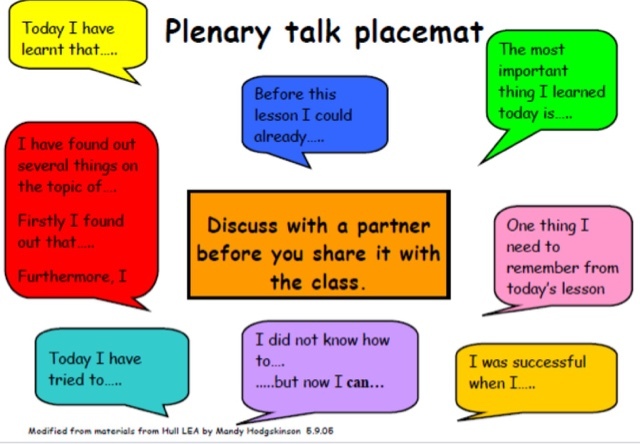 This was fabulous, thank you for sharing this because it will really help our school and what we are looking for next.